Mordenkainen’s Tome of Foes makes building challenging encounters exciting–one of the reasons is the bounty of monsters available in it–but that’s only part of the equation. Let’s talk about encounters. In Dungeons and Dragons, the smallest unit of gameplay can be broken down into a single encounter. Whether it’s roleplaying with a shopkeeper, fighting assassins on a rooftop, or even just trying to figure out what glyphs unlock the next room. Encounters fuel adventures, adventures string together into campaigns–and the right encounter can be a seed for any or all of these. That’s where Mordenkainen’s Tome of Foes comes in. There are 140 monsters in the book, but it’s not just the number of monsters in the book–it’s the way they’re presented. Story is a little more at the forefront here, and it’s not just in the 114 pages of lore, setting information and so on–it’s in the mechanics themselves. Pick a section and you’ll find a mechanic that backs it up. The devils and demons of the Blood War have their cultist templates and demonic boons, Duergar and Gith have psionic powers to reflect the ministrations of the Illithids. And the monsters themselves have a ton of tactical depth. You can see some of this at work in the Duergar and Starspawn monsters from the preview adventure–but you can find it in just about any monster. So let’s take a look at how Mordenkainen’s Tome of Foes can help seed an adventure. Let’s take a look at our friends the Ogres. In Mordenkainen’s Tome of Foes, we get to see a few new twists on an old favorite. The ones presented in Tome of Foes are each geared for a specific purpose. 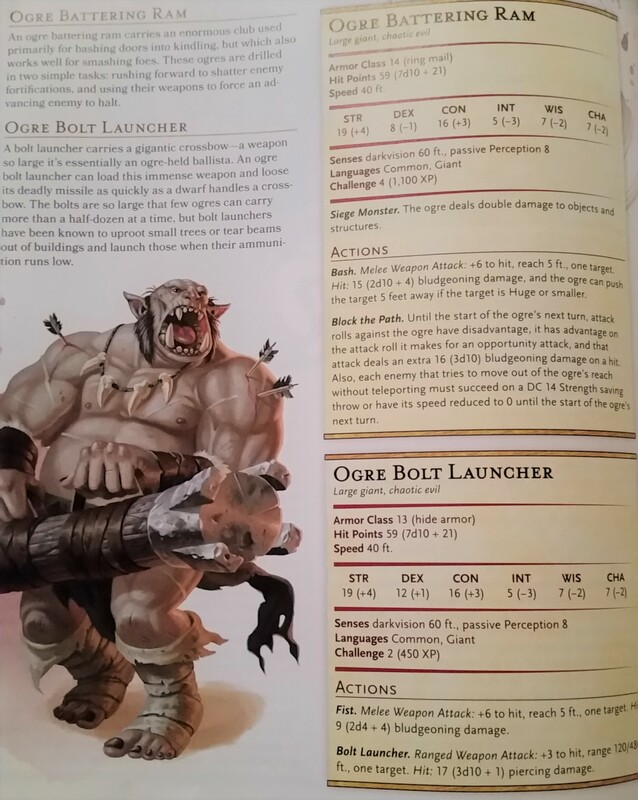 There are four new ogre types, the Ogre Battering Ram, Bolt Launcher, Chain Brute, and Howdah. This one is the clear winner. Looking at the stat blocks, they are all just ogres but with a few special abilties. As you can see from the fluff, each of these monsters is trained to fill a specific kind of role–and sure this might be a little on the nose–but in general when reading through the monster entries, I had an easier time figuring out how these monsters might be used. Tome of Foes is much less a presentation of monsters in a vacuum, and it makes a difference. When sitting down to try and plan an encounter (again, it all comes back to those) it’s easy to picture a fight in which each of the Ogre types is employed. 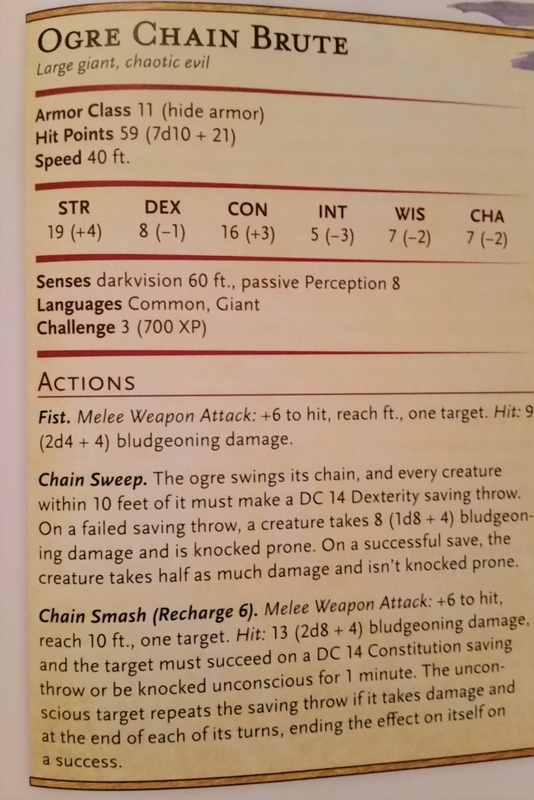 Their abilities suggest their ideal use case the path blocking of the Ogre Battering Ram (and the siege monster ability) and the Chain Sweep of the Chain Brute suggest a place in the middle of a big battle. They need foes to hit with area of attacks and places to attack or protect. They all work together as a kind of strike team that you could see laying siege to a castle or a fortress or something. 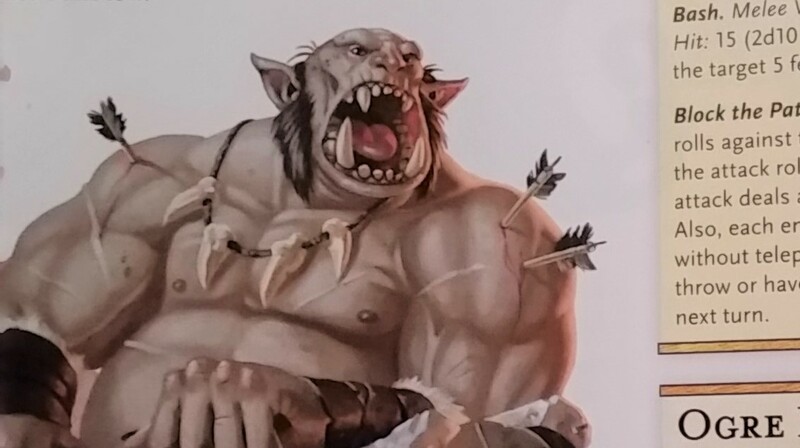 These are Ogres that go on the offensive–they are meant to be used actively, they come to the players, rather than players stumbling on them. Now, depending on the level of your players, fighting each of these might be really tricky–they’re only Challenge 4 (at best), but they can threaten a low level party pretty well. Especially the Howdah if it’s loaded down with small creatures (which you’d want it to be, otherwise why bother taking it?). So, thinking about it–you could either break them up into set-piece encounters. 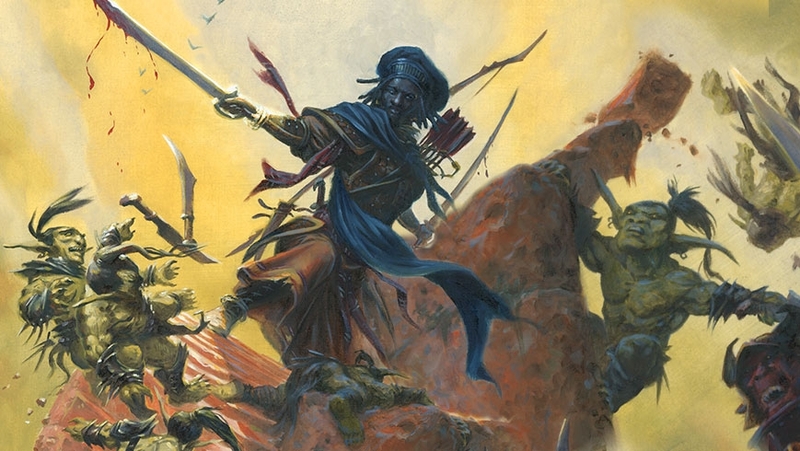 First a party fights a Bolt Launcher or Bolt Launcher and Chain Brute trying to attack a site–then fighting past them, they could encounter a fully loaded Howdah and cap it all off with an Ogre Battering Ram for a climactic end of the adventure kind of fight. That’s probably a whole session’s worth of encounters–a mini-adventure all in one. And then of course, once you have that encounter planned out, it’s time to fit it in with the world. Who sent the ogres? There’s obviously a powerful creature behind them, because it takes time and brute force to train ogres like this. It could be a concerted goblin raid, or a band of Hobgoblins who’ve whipped up a local tribe of goblins into a makeshift army to try and claim territory for a burgeoning empire. But in planning this encounter, the seeds for more are sown. Same goes for even generating one at random–Mordenkainen’s Tome of Foes gives you enough information about each monster to give a sense of where they do and don’t fit with the rest of the world, so it’s easy to try and justify why they’re there. It’s a great boon for encounter building whether you’re an experienced GM or just taking your first shot at setting something up behind the screen. And the more you read, the easier it is to drop into that mindset. So keep all that in mind as you flip through Mordenkainen’s Tome of Foes.